Terry Lippincott has always loved to race. He was a regular at the local autocross circuit starting back in the 1970's. In 1999, Terry purchased the wrecked '63 E-Type race car that belonged to his late-friend Ray Kennedy; Ray died in a tragic crash at Summit Point earlier that year. Terry did a total ground up restoration of the body and mechanicals from July 1999 to March 2001. 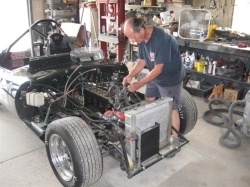 When the car was completed in 2001, Terry showed up at the SCCA driver school at Summit Point Raceway in West Virginia with his E-Type race car . He was there to learn how to drive the thing. 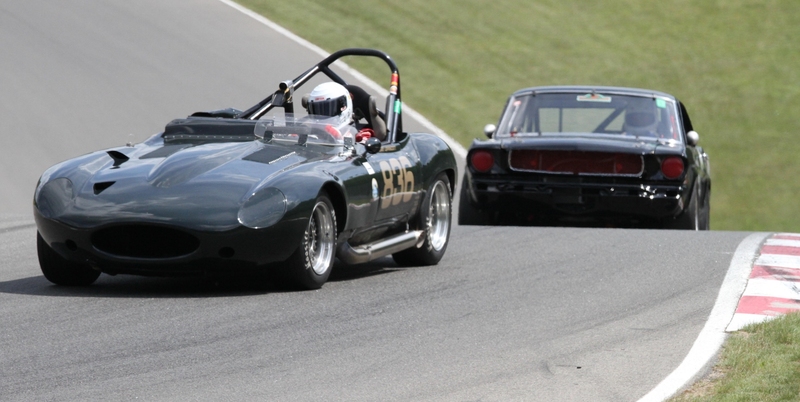 Terry routinely runs the E-Type race car in SVRA sanctioned events held at Summit Point WV, Watkin's Glenn NY, and Circuit Mont-Tremblant in Canada. Terry Lippincott and his 1963 E-Type race car. The engine was overheating during the last race at Mont-Tremblant. Terry pulled the head and discovered that the head gasket was failing, allowing pressure from two adjacent cylinders to escape into the water jacket. 1963 E-Type #878221 owned by Bill Hapgood. Raced in Canada, Laguna Seca in Monterey, California, Riverside California, and Portland Oregon. Ray Kennedy purchased the car from Bill Hapgood. Car was painted red and had a 3.8L engine. Brian Redman drove the car at SVRA Mid Ohio race. HSR Sebring race car now black with a gold stripe. The 3.8L matching engine number blew at Mid Ohio. Terry Lippincott/Lippincott's Garage built and sponsored a replacement 4.2L engine, transmission, rear, brakes, and pit crew. Ray Kennedy ran many HSR, SVRA, Jefferson 500, and Targa races. Jefferson 500, Brian Redman and Ray Kennedy each drove half the enduro races. Tragic crash claimed the life of Ray Kennedy. Terry Lippincott and Tom Henwood bought the crashed car. Terry rebodied the '63 E-Type using every original part that was still usable. Car now painted dark British Racing Green. Car back on track and Terry spent eight months getting SCCA and SVRA licenses. Continue to run HSR, SVRA, and Jefferson 500 as often as financially able.